"Microsoft PowerPoint Template and Background with a capture of a road leading into the fall foliage" Our Fall Road Nature PowerPoint Templates And PowerPoint Backgrounds 0611 are designed for authenticity. They do not encourage any farce. Report problems with our Fall Road Nature PowerPoint Templates And PowerPoint Backgrounds 0611. Download without worries with our money back guaranteee. 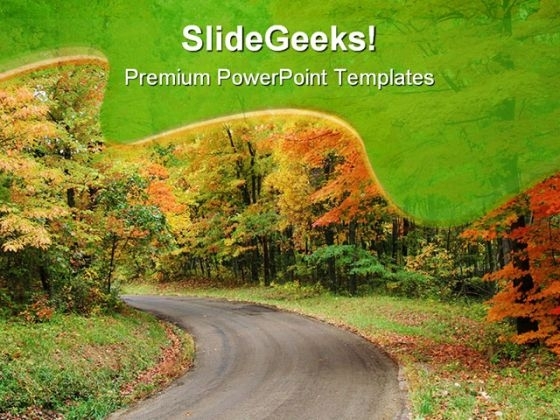 "Microsoft PowerPoint Theme and Slide with a capture of a road leading into the fall foliage" Conduct meetings with our Fall Road Nature PowerPoint Themes And PowerPoint Slides 0611. Download without worries with our money back guaranteee. Our Fall Road Nature PowerPoint Themes And PowerPoint Slides 0611 are destined to meet your standards. They conform to your exacting demands.